The Culinary Center is the heart of your Certified Angus Beef ® brand experience, but there's no one-size-fits-all visit. Plan to visit a working farm, participate in sales training or register for a chef competition. Expert or novice, we welcome you to join our team for an engaging experience where you'll make connections, deepen your expertise and, of course, enjoy delicious, top-quality beef! 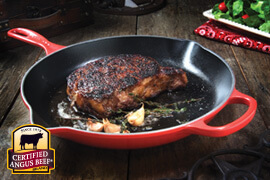 What is the Certified Angus Beef ® Culinary Center? Simply put, it's a unique, state-of-the-art facility designed to showcase quality beef and offer guests the opportunity for custom, immersive learning opportunities. Programs are geared to beef professionals – chefs, restaurateurs, foodservice distributors, retailers, butchers, processors and meatpackers – looking to boost their business by mastering the science and art of quality beef while enjoying an unparalleled culinary experience. Is The Culinary Center open to the public? No, our culinary center is private and reserved for business-to-business objectives. Programs are by invitation only. Our guests rely on top-quality beef as an integral part of their businesses and are looking to take their expertise to a new level. Our sessions are geared to guests' individual needs and business goals. They may include beef butchery, exploration of underutilized cuts, artisanal techniques like charcuterie and dry-aging, custom grinds, or beef grading and the brand's exacting specifications. Guests may also experiment in the kitchen with specific cuts, techniques or equipment, learn about culinary trends and emerging flavor profiles from our culinary team, or participate in a "mystery basket" competition. We know the bottom line matters, too – so our team can discuss ideas for retail case merchandising or ideas, profitable alternative cuts, novel presentations and other marketing solutions that can boost your profitability. And, of course, you may want to visit a local Angus farming family to learn more about the brand's ranching heritage and how good decisions at the farm can help ensure a great eating experience at the table. Please contact our team using the form. We'll be in touch to discuss your goals and program options.